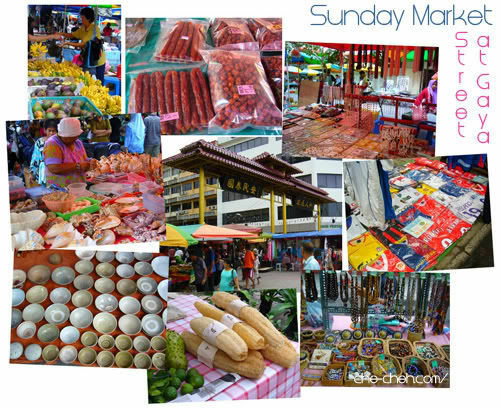 The Sunday Market look exactly like our ‘pasar malam’ or any other makeshift morning market found in Peninsular Malaysia except this market stretch along the whole of Gaya Street which is VERY VERY long. The area around Gaya Street is also known as Chinatown. Rows of antique grocery shops, Chinese restaurants and offices grace both sides of the morning market. Psst Dreamcatcher, where’s my Tamu? Jidane’s and Dreamcatcher’s first prey was the tee-shirt stall. Jidane did all the haggling work while we waited. Then I spotted a dim sum restaurant and ‘tapaued’ a plate of dim sum. Ohgosh so yummy. We had a quick breakfast at a nearby food court before heading back to our lodge with (of course) little bundle of goods. It was time to check-out from the hostel but not before I leave a message on the card. We snapped a couple of pictures in the lodge before saying our goodbye to the staffs. By about 11.30am we left Kota Kinabalu for Kundasang (2 hours drive). 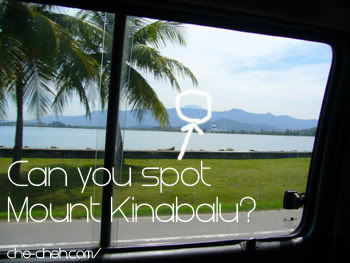 On a clear sunny day, Mount Kinabalu can be seen from Kota Kinabalu. As we travelled nearer and nearer to Kundasang, the view of the majestic Mount Kinabalu looms larger and larger. We were ogling and snapping our way until our tour driver decided to stop by a scenic spot for us to take more steady and beautiful shots of Mount Kinabalu. Few minutes later we stopped by Pekan Nabalu, where a stretch of souvenir stalls and a tower built specially for viewing Mount Kota Kinabalu lies. Don’t bother buying anything as it’s expensive. Another few minutes journey brought us to Kinabalu National Park (Unesco’s World Heritage Site). 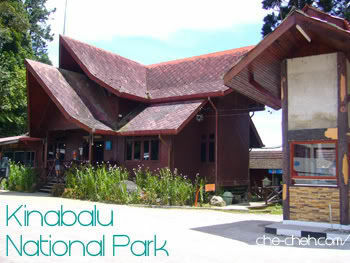 This park is the gateway to Mount Kinabalu. This is where we register our names and registered our names we did. Wohoooo! 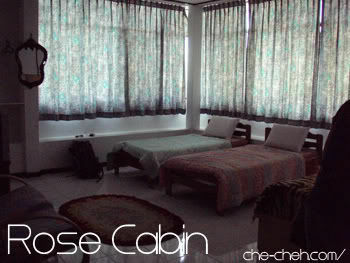 Our final stop for the day is Rose Cabin, our 1 night accommodation which cost RM40 per pax. 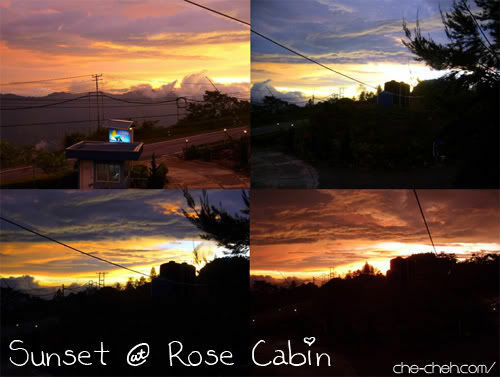 Rose Cabin is just a few metres away from Kinabalu National Park. The main reason we stay a night there is because we wanted to get use to the altitude. 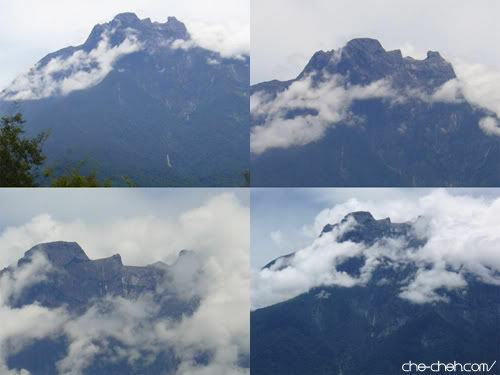 Kinabalu Park lies 1,563m (5,128 feet) above sea level. We were told that 4 other climbers will join us tomorrow because all 8 of us are from the same tour operator. The room consist of 2 single size beds, 1 queen size bed and 1 double decker bed. More than enough for all 4 of us. We spent our afternoon watching TV, playing Scrabbles and sleeping away. It was quite hot in the afternoon as there is no air-cond and our room is facing sundown. But my oh my the sunset view (@ 6.28pm) were so awesome. As the stars begin to emerge into the night, the air become colder. And I was shivering like mad at 7.15pm!?! I got a headache after that because I was too cold. We booked our lodging without meals included but somehow dinner and the next morning breakfast were prepared for us. Thank you tour operator. I felt better after dinner. Fhewww! Oh btw I didn’t shower that night because the water was icy cold and we have no idea why the hot shower wouldn’t stay hot. It was the freakiest hot shower I have ever seen. Have you seen a hot shower that uses gas like those conventional cooking gas stove. When we turn it on, it would go ‘tack tack tack’ followed by a very loud frightening BOOM. Scary! At night in the room, the floor feel like ice. Gosh the tiles floor is REALLY COLD! The moment my toes step on the floor, my body send an immediate ‘pain’ message to my brain. And that was how and why my headache came back. I slept with 2 socks and luckily we were provided with 2 blankets. 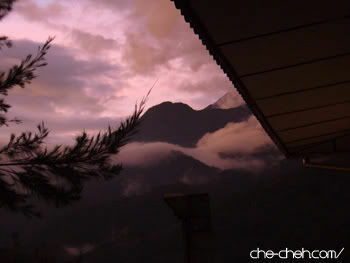 It was the night before our inaugural Mount Kinabalu climb. I was worried. Worry I couldn’t reach the peak, worry my legs wouldn’t hold, worry about toilet issue (LOL), worry about altitude sickness, worry about the cold climate up there, worry I couldn’t sleep a wink at the resthouse… hahaha a lot of worries hor? But there was something that I’m not really concern about. My shoe. I’ve decided to wear Beach Crocs for the climb. I wore Crocs throughout my first 4 days journey and I felt confident about the shoe. Dreamcatcher felt good about it and so was I. So here goes nothing! Sounds like a lot of fun !!!! Hurry up … post about the climb !!! This I have to read. Quickly post the next one ….hehehe… nice post series on KK btw. Reminds me of home. Mo-C, yuppy! Photo taken by my sista. Crocs shoes safe for climbing or not? Your trip sounds fun but really tiring right? 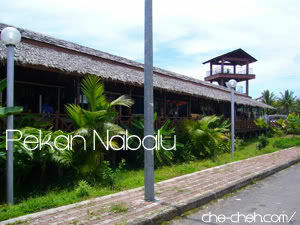 I’m planning to go to Sabah but not going to climb Mount Kinabalu. No stamina lar. Hcfoo, my trip sound tiring? in actual not a bit man! Crocs shoes are not safe for climbing but they’re safe for climbing stairs! From bottom to the top of Mount KK, all you see is STAIRS! well, except the final 1.5km where you just walk up! The mountain rocks are granite so no worry about slippery rocks. Hehe start training now. Frankly speaking I didn’t train that much. Coming soon. Still writing it. Clement, wohoo hi-5! So how you find the climb? You’ve stayed there so long guess that’s why not so exciting. It’s tiring for me because I see there’s a lot of heavy activities going on. You look fit! So I don’t think you need any training. Hcfoo, you can go there just for the climb. I will tell you later how long we ascend and descend the mountain. I’m not fit. :tongue: Couldn’t even jog for long. I am glad you had such a wonderful time there. The pics and its arrangements are as stunning as usual. Tee hee hee… HoChiak! Kleio, ahhh where have you been dear? Missing you la. hehe yea… the posts are finally up. I’ve been up the mount 3 times already. Wonderful experience. We always use a locally made shoe called the 4 stripe Adidas. 😎 Damn cool shoe fully made of rubber with spikes on the bottom. You’ll see most of the guides wearing them especially on the summit. Only costs 15-20 ringgit if I’m not mistaken. WilsonC, OH WOW WOW WOW. :kowtow: :kowtow: :kowtow: I suppose the feeling won’t be the same each time. Aiseh makes me wanna go for the second time. :thinking:Too bad I didn’t pay attention to their shoe although I did look at my guide’s shoe. No spike or stripe. Where was I you ask? Well hmmm… let me see… Oh ya, I’ve fallen into a deep deep drain and was struggling hard to get out. I guess I am finally out now. Though not without some mental bruises on my soul. But I will survive. Ak47.©ôm, hey you can email me at my gmail. Click on the contact page. Sorry, not convenient to give my contact no.